Every eight years, over 500 universities from New York to DC and other locations abroad participate in an accreditation process conducted by the Middle States Commission on Higher Education (MSCHE). MSCHE is a “voluntary, non-governmental, membership association that defines, maintains, and promotes educational excellence” through a rigorous process of self-study, site visits, and peer review. Accreditation by MSCHE is essential for the university. Not only does it affirm the university’s quality, it also is a federal requirement making students eligible for financial aid such as Pell grants and faculty able to apply for funding from federal agencies. 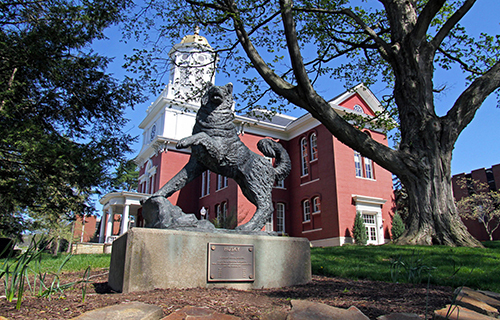 Bloomsburg University has been accredited by MSCHE since 1950, with the next Self-Study Evaluation occurring in 2019. Sheila Dove Jones, Ed.D., Assistant Vice President, Office of Planning and Assessment, serves as Bloomsburg University’s Middle States Accreditation Liaison Officer (sjones@bloomu.edu). Public Disclosure: Bloomsburg University of Pennsylvania is accredited by the Middle States Commission on Higher Education, 3624 Market St., Philadelphia, PA 19104. (267-284-5000) www.msche.org The Middle States Commission on Higher Education is an institutional accrediting agency recognized by the U.S. Secretary of Education and the Council of Higher Education Accreditation. A Steering Work Group was selected to design an institutional Self-Study and coordinate the re-accreditation process. Eight working groups were established to thoroughly address the seven standards and compliance component that are the focus of the self-study and review process. A combination of approximately 90 faculty, staff, and students are participating in this process. The Self-Study highlights the University’s distinctive mission, the student learning experience, noteworthy accomplishments since last accredited, and areas for improvement. The Self-Study was submitted in January 2019 and the process will culminate with a team of peer evaluators who will use the report as the basis for an on-site evaluation in March 2019. The MSCHE re-accreditation determination is expected in June to November 2019. The final Bloomsburg University Middle States Self-Study Report (2019) and the Evidence Roadmap are available to the campus community. Use your BU network login and password to access the documents. Please email questions to Deb Mucci: dmucci@bloomu.edu. MSCHE recognizes the value of information provided by individuals in determining whether an institution’s performance is consistent with MSCHE standards for accreditation. MSCHE’s interest also is in assuring that member institutions maintain and follow appropriate grievance procedures. The MSCHE procedures address non-compliance with its standards for accreditation, requirements of affiliation, policies or procedures, or the institution’s own policies or procedures. Matters outside of MSCHE’s purview include disputes between individuals and affiliated institutions about admission, grades, granting or transferability of credits, application of academic policies, fees or other financial matters, disciplinary matters, contractual rights and obligations, personnel decisions, or similar matters. MSCHE expects individuals to attempt to resolve the issue through the institution’s own published grievance procedures before submitting a complaint to MSCHE. Please view MSCHE’s full complaint procedures and policies. Contact complaints@msche.org for additional information.